McLaughlin’s take on the Captain is nice (he missed Cap’s chest symbol in the first panel). There really wasn’t anything for Cap to do in this issue. 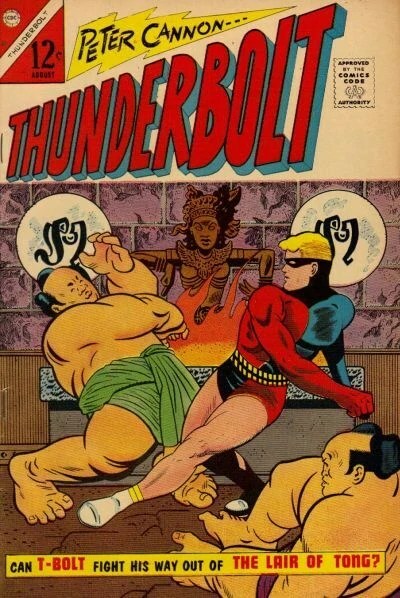 I’d like to think Captain Atom’s inclusion in this book was to help boost Thunderbolt’s sales or something, but they made no mention of his appearance on the cover. The story is what it is — just facts — so I give it a D. The art was pretty good but nothing fantastic, maybe a C+. Overall, “Captain Atom’s Secret” is a C.
This “universe” was absorbed into DC Comics’ Multiverse when the Charlton characters were purchased by DC (including Peter Cannon). This universe became Earth-4.